5% of the European internet population are expected to view the Six Nations championship this year, which makes it Europe’s most-watched rugby championship alongside the World Cup. The UK alone is home to more than a quarter of Six Nations viewers1. The Six Nations championship is the best attended sporting event in the world. It beats high-profile competitors like the NFL and the football World Cup. We took a close look at this audience to help brands understand their defining characteristics and sense check their campaigns for 2019 and beyond. 1. Six Nations viewers use search engines for brand discovery. 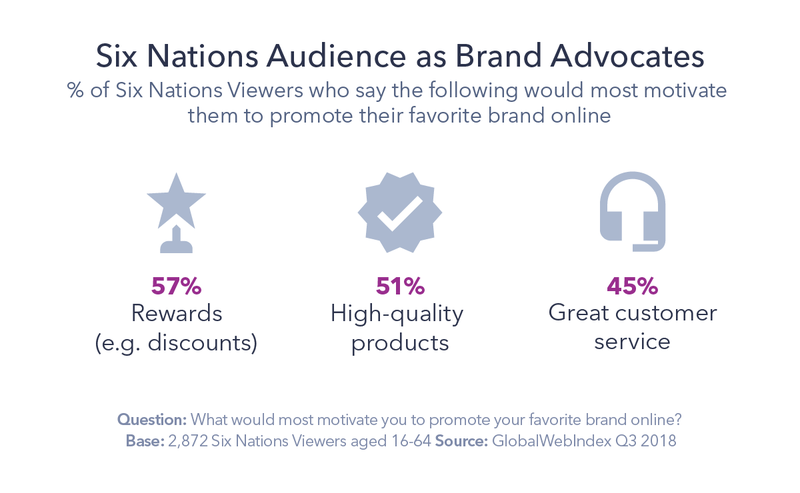 63% of Six Nations viewers say researching products and brands is one of their most important reasons for using the internet, which is 14 percentage points above the global average. Although search engines only recently surpassed TV ads in the first stage of the purchase journey, Six Nations viewers are 34% more likely to cite them as their main source of brand discovery (51% do). TV ads tend to be the first or second-most popular brand discovery channel, but this is not the case with Six Nations viewers. They’re more likely to cite family and friends’ recommendations than TV, though only by a small margin. Out of the five countries with the highest concentration of Six Nations viewers, those in South Africa have the most traditional ways of discovering brands. Viewers there are more inclined to find out about them through TV ads. While app-based brand discovery, vlogs, and expert/influencer posts are widely discussed in the industry, they have proved to be more effective with younger millennials and Gen Zers. 2. Loyalty is at the core of the path to purchase. Six Nations viewers are an attractive audience in part because they’re very brand loyal: 71% tend to stick to brands once they’ve found one they like, versus 61% on average globally. So what does it take to fulfill their desires as customers? A third of Six Nations viewers say they want their favorite brands to make them feel valued as customers – it’s the single most common request. On top of that, they value financial incentives above easy return policies and next-day delivery. They also respond well to concrete incentives: coupons/discounts (49%) and loyalty points (43%) are the second and third-most commonly mentioned purchase drivers for this audience, after free delivery (77%). 3. Brand interactions on social media are limited. Overall, Six Nations viewers have traditional media consumption habits. They spend an average of 1h 49m on social media per day: 31 minutes less than the average internet user. This time is mainly spent on social networks, keeping up with the latest sports news and events. This audience is also less likely than average to follow brands or to discover them via updates on their social media pages. Six Nations viewers are 1.3x more likely to follow sports stars and journalists on social media. They spend significantly less time on their mobile phones than most people, at 2h 13m compared to the average of 3h 19m. This means they still rely on larger screens for most online activities like product searches, buying and selling, and to access the internet in general. For instance, 69% have used their PC to purchase a product online in the past month, compared to 39% on their mobile. 4. Six Nations viewers are traditional TV consumers. Watching TV is a large part of Six Nations viewers’ daily routine. They spend an average of 2h 34m watching broadcast TV per day, devoting only 52 minutes to online TV streaming. This is also reflected when it comes to watching the Six Nations championship. Just under a quarter of them say they watch it online, while the large majority (92%) choose linear TV. They prefer to watch broadcasted content on the TV (88%), followed by PCs (44%). Globally, mobile units are the most popular way to watch subscription services like Netflix, but Six Nations viewers choose to primarily do this on their TV as well. Besides TV advertising, how can brands engage them while they’re on the big screen? Second screen devices provide a huge opportunity for brands to maintain the attention of consumers across platforms. 62% of Six Nations viewers use their smartphones while watching TV. Six Nations viewers are 1.5x more likely than average to read their emails while watching TV (51% do). A large share of them (46%) are also on social media, most likely reviewing commentary and opinions of the game. 5. Facebook is key to second-screening. Six Nations viewers are active social media users when it comes to sports. 3 in 10 say watching or following sports events is one of their main reasons for using social media. This is considerably higher for younger respondents, nearly half of which made this statement. Facebook stands out in particular when it comes to sports second-screening. 16% of Six Nations viewers said they have commented on a sports event or match they’re watching, rising to 21% among 16-35-year-olds. This is a timely opportunity for brands to tap into fans’ passion and ignite conversations while getting their message across. Being part of the fan base by participating in discussions and posting exclusive content may be one way to raise awareness and grow a brand’s social media community. It’s a very exciting time for sports brands to increase their presence on Facebook as the platform is restructuring its global sports division in 2019. Key priorities will be the development of sports accounts, as well as boosting the number of sports media collaborations. 6. Six Nations viewers enjoy a drink. Sport coverage and alcoholic beverages are commonly enjoyed together across the world, but Six Nations Viewers are even more likely than the average sports fan to drink alcohol. 30% of them say they do it regularly, compared to 16% of Premier League fans and 13% of all internet users. Pub culture is closely associated with rugby, so it should be no surprise that beer is the most popular choice. 77% of Six Nations viewers drink beer at least once a month. Heineken is the most popular beer brand among the viewers: 22% of Six Nations viewers drank it in the last month. This holds true for both males and females, as well as all ages and income groups. Heineken has actively honed in on this connection leading a rugby fan club and sponsoring numerous rugby-related initiatives. The latest one is the brand’s sponsorship of a new rugby podcast on Ireland’s sports website The42, through which the brand aims to solidify its relevance among rugby fans. Targeting Six Nations viewers in 2019. Six Nations viewers is an ever growing consumer segment and is high in spending power, especially around the upcoming sports event. Search engines and word-of-mouth recommendations are the most effective channels for brands looking to prompt them along the purchase journey. However, a lot of their time while watching the championship will be spent on Facebook, offering a great opportunity for brands to start a conversation and earn their loyalty as customers. 1Six Nations viewers are internet users who watch Six Nations on TV or online. Note that China is excluded from percentages relating to specific/named social networks and apps. The post 6 Things to Know about the Six Nations Audience appeared first on GlobalWebIndex Blog.